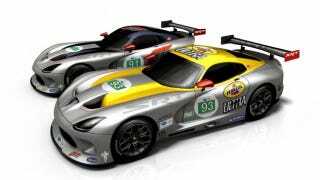 ALMS gets more American later this year with the return of the Viper. Specifically, the SRT Viper GTS-R. Now it's got a livery, as shown in this drawing courtesy of SRT President Ralph Gilles. They were just revealed so you're amongst the first to see them. Gilles told me via Twitter a few minutes ago that "These illustrations by Alan Macey were done this past Thursday night! We are painting the cars on Monday!" The 91 car carries a giant Forza logo over its cobalt blue-over-silver paint scheme. The 93 is PMY-over-silver with a Pennzoil sponsorship. Speaking of Twitter, Ralph has more hair than followers at this point. Go on and give him a follow.